Collapsible water bottle, lightweight and portable. Made of BPA free & FDA approved food-grade silicone, which is leakproof, odor free and safe. A perfect partner for daily, sports and travel! Collapsible water bottle, which adopts unique spiral design, is lightweight and compact. 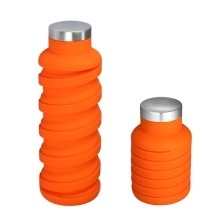 Bottle body is made of food-grade silicone, BPA free & FDA approved, safe to use and odor free. -40~150°C / -40~302°F using temperature range makes it safe for both hot and cold beverages. The cap is made of 100% premium kitchen-grade stainless steel, leakproof and secure seal. It&apos;s 5 inches tall when fully collapsed(200ml), and 8.5 inches tall when fully expanded(600ml). It only weighs 6oz when empty, portable design makes it perfect for beach, hiking, running, gym, daily, travel, etc. Wide mouth opening enables you to easily add ice cubes, tea leaf, sugar, etc. Dishwasher safe, easy to wash, reusable. 1. Our product can bear up to 150°C / 302°F, but to avoid burning your hands while holding it, we do not recommend you to use it for the liquid over 60°C / 140°F. 2. Keep the bottle away from the sharp objects.